The story of Martha and Mary has been told a million times over. Martha busied herself with meaningless household tasks, while her younger sister Mary took the posture of a traditional Jewish disciple (a scandalous thing to do as a woman, let the reader understand) and sat quietly at the feet of their rabbi guest, Jesus. Mary chose better. Mary did the right thing. And poor Martha gets tossed under the bus. Her tasks of hospitality were apparently not good enough. Yeah, yeah, we get it. We know the take-away: sitting at the feet of Jesus and listening to his teaching is more important than the endless to-do lists we carry. Subject closed. But what if we’re missing something? What if we have become so familiar with the story that our bored ears can no longer hear the strong pulse of the narrative? Recent exegetes have instinctively felt that something is wrong with the conclusion that Mary’s activity is worth more and Martha’s activity is worthless. In her work, The New Perspective on Mary and Martha, Mary Stromer Hanson provides a unique invitation for the reader of Luke to hear the story with fresh ears. She asserts that maybe, just maybe, the story is not about proper hospitality, but about the issue of women’s leadership. In a culture that expected women to remain close to the home and under the authority of men, Hanson suggests that the story radiantly displays the expansion of the kingdom by demonstrating the different ministry roles of Martha and Mary. It is to her credit that I extend this invitation. Let’s start with the story as described by Luke and from there we’ll move into Hanson’s thoughts. The story, like any story, is best understood through the context in which it was written. Here we must put on our first-century lens. When we do so, we see the many layers of cultural norms and the radical ways in which Jesus breaks through those norms to usher in the kingdom. Traditionally, only men were allowed to study the Torah. While there were no binding legal injunctions against women engaging in theological studies, it was never an encouraged endeavor. Instead, women were encouraged to stay close to the home, learning the duties of domestic life. As life was governed by the struggle for a portion of the limited amount of honor available, a man’s honor depended on his ability to protect the sexual exclusivity of women in his family. To remain faithful to the strict honor/shame system of first-century Judaism, women were not to appear in public places without the company of male relatives. If ever they did so, shame was brought upon their household. With this brief insight into the cultural context of Luke’s narrative, we are liberated to see, a little more fully, the radical nature of Jesus’ behavior. Jesus appears to disregard social codes typical of the culture of elite males. Jesus breaks an item of protocol when he, and unmarried rabbi, has apparently left his disciples to meet Martha and Mary unaccompanied. His time in the home of Martha and Mary teaches us not the code of first-century Judaism, but the code of the kingdom. When Martha greets Jesus, it is more than a hospitable welcome. 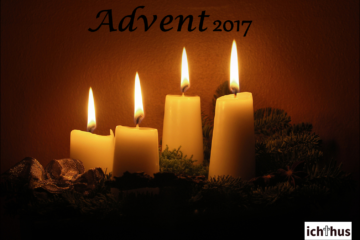 Her greeting suggests Jesus has entered a home that has accepted his mission and call. As disciples, they have various modes of serving the mission of Jesus. Martha, the elder sister, has a ministry that keeps her close to the home. The story tells us that she is doing her ministry tasks, but that she is worried and distracted. What distracts her? What is the source of her worry? Traditional interpretations suggest that Martha is distracted by the tasks of her ministry, but is that the case? Upon close reading we find that it is not her tasks that are the source of her distraction, but the ministry of her younger sister. As you might see, the story is often understood that Mary is physically present in the home, sitting at the feet of Jesus. 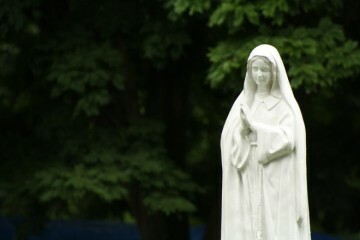 But the question is often asked, why does Mary remain silent? Why is she not given any speech? And why doesn’t Martha just ask Mary for help? The conclusion, says Hanson, is because Mary isn’t even there! Her role of ministry has taken her away from the home. 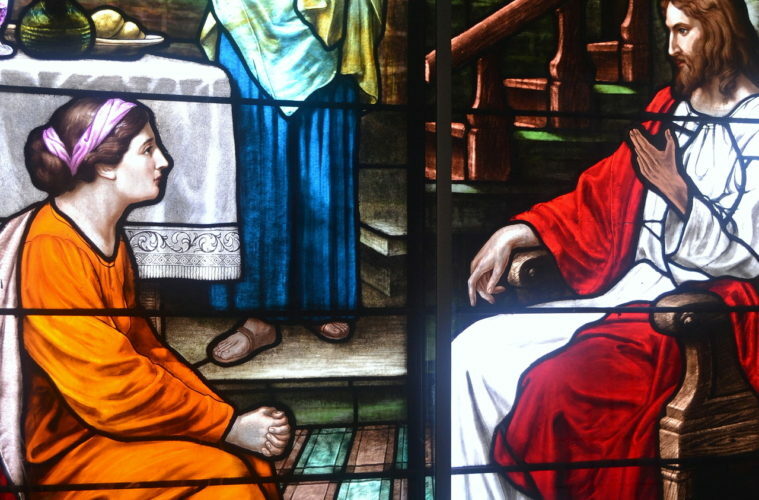 And so Martha pleads with Jesus to speak to Mary. “Lord, do you not care that my sister has left me to do all the work by myself? Tell her then to help me.” Martha is anxious about her sister’s ministry and fails to focus on her own. And it is this distraction that Jesus rebukes, not the ministry or tasks of Martha. In sum, Jesus is telling Martha; be faithful to your ministry role. Don’t be distracted by the role of your sister. She has chosen what is better. She has chosen to be faithful to her ministry role and I will not take that from her. With this interpretation of the story, the ministry roles of Martha and Mary are no longer pitted against each other in such a way that one has correct priorities and the other is misdirected. With this interpretation we see Jesus forming a new code of honor. This new code was the code of the kingdom, one in which gender roles were eased, mutual submission replaced hierarchy, and ministry callings were determined by giftedness, not appearance. With this, I propose another challenge. Is it not the case that twenty centuries later, we see that similar cultural norms continue to exist? Gender roles still apply, hierarchy seems to be just as strong of a framework as it was in the first century, and unfortunately, ministry roles (as we think of them) are frequently filled by those who look the best, talk the best, and have the best collection of academic achievements. But what would it look like if we were to allow Hanson’s interpretation of Luke to challenge our norms? What if we were to support and celebrate the ministry roles of our brothers and sisters rather than criticize the ways in which they might fail to adhere to our societal expectations? If a woman has the gift of preaching, who are we to keep her from using her gift to build the church? Let her preach! If a man has a gift for teaching children, who are we to keep that role for women only? Let him teach! Spiritual gifts are generously given for the equipping and unity of the church. What a disservice we do to one another when we confine ministry roles to one gender over the other. The kingdom is large and diverse and it takes all kinds of people to participate in Jesus’ mission. Jesus’ behavior eliminates the divisions we have created between people groups. In the kingdom, “there is no longer Jew or Gentile, there is no longer slave or free, there is no longer male and female; for all of you are one in Christ Jesus” (Gal 3:28). Brianna Millet is a guest contributor to The Harvard Ichthus. Next ArticleIs The Church Inherently Conservative?